Eltronicschool. 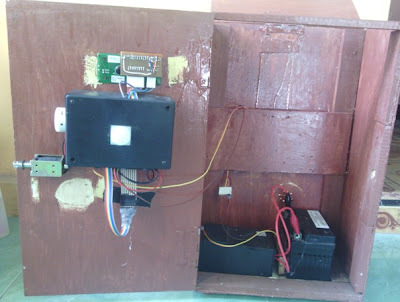 - To begin our project, in this time we will present you one of our project that we titled with Prototype of Cabinet Security Device Using 3 Levels Password Based on Microcontroller AT89S52. As we have seen that with the rapid advancement of technology today, it is necessary also tools that can work automatically. One application of these tools in the field of security is now more prone to theft. Places that need to be secured one of which is the closet, because many people are storing valuable goods cupboard. 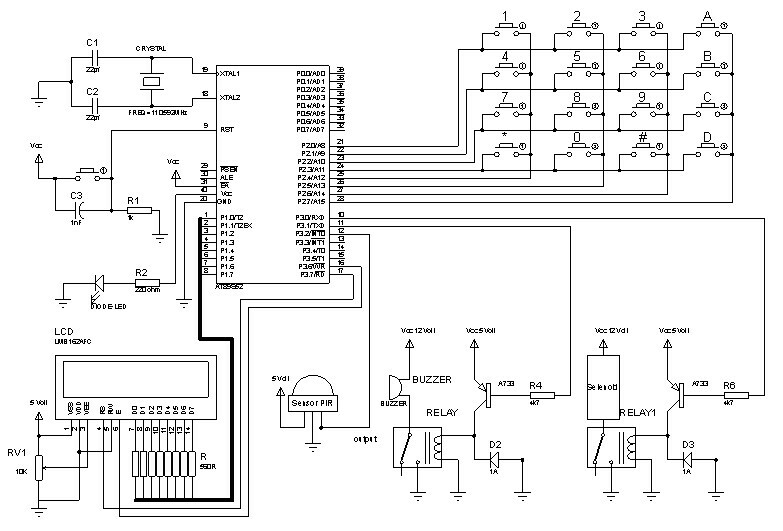 In this project will be made a prototype of a safety cabinet using 3-level password-based microcontroller AT89S52. Password is fed there are 3 levels, these are password 1, passwords 2, and passwords 3. Each password consists of four characters, so the total number is 12 characters. To be able to open the cabinet needed input from the keypad password that will be displayed to the LCD. If the password is correct then the PIR sensor will turn off and lock the closet door open. If the password is incorrect alarm will continue to press the reset button. Passwords can be changed as the user desires. Batteries are used as a backup if the electricity. How does a safety cabinet design electronic circuits using 3-level password-based microcontroller AT89S52. How does the performance of a series of safety cabinets using 3-level password-based microcontroller AT89S52. 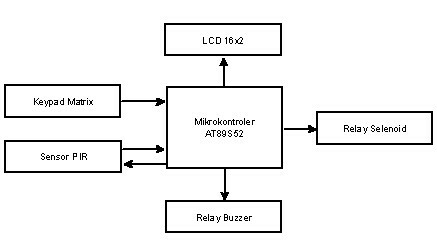 How is the implementation of a safety cabinet using 3-level password-based microcontroller AT89S52. Security system with sensors on closet light is divided into six blocks, the block matrix keypad, LCD 16x2 block, block PIR sensor, microcontroller AT89S52 block, block solenoid relay, buzzer and relay block. 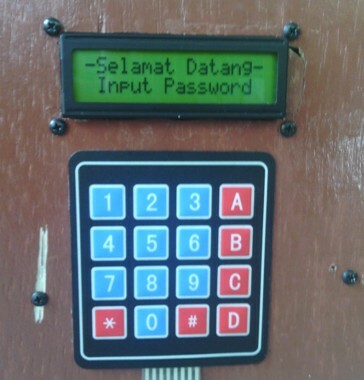 Tool became active when the LCD display displays the words "Selamat Datang - Input-Password", after the password 1, 2 passwords, and passwords 3 fed properly, then the sensor will be turned off, the solenoid circuit will unlock the closet door and the text will appear in the LCD "Open Door Press button A". Menu will appear when the doors open the DOOR CLOSE, CHANGE PASSWORD, and TOOL MAKERS. A button is used to enter to choice the menus, buttons B and C to transform the menu button. CLOSE DOOR menu will activate PIR sensor and locking cabinets. CHANGE PASSWORD menu to change the default password to a password that the user program fed, so users are free to create their own password. TOOL MAKERS menu will display the security appliance cabinet maker at a glance. Alarm will be activated if the PIR sensor detects thieves who go to the closet and when fed the wrong password more than 3 times. Alarm can be turned off by pressing the A button C and sequentially, and the cabinets will be locked again become senso active. When the electricity goes out, the system remains active safety cabinets for the 12 volt battery. Password will be returning to the program default if there is no power at all. 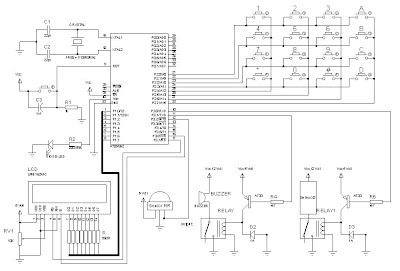 Safety cabinet design using 3-level password-based system consisting of a microcontroller AT89S52 AT89S52 mikrokotroler minimum, PIR sensor circuit, buzzer circuit, the solenoid circuit, circuit LCD 16x2, 4x4 matrix keypad, and programs. 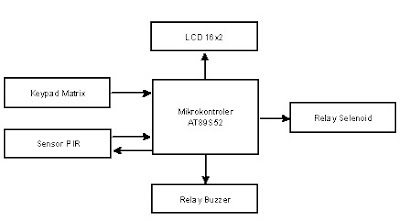 The system will be activated if the password is entered correctly 3 levels ie password 1, 2 passwords, and passwords 3, each of which consists of a 4 character password, then AT89S52 microcontroller circuit will turn off and turn on the sensor relay to drive the solenoid and unlock the cabinet. By the time the doors opened on the display there will be 3 options, ie close the door, change the password and tool makers. Alarm will be activated if the password is entered incorrectly three times sebannyak. The system will reset again if in the press the C and A in turn. At the time of the PIR sensor detects human motion in the closet then the alarm will be active. Implementation of the system used in the cabinet with the results as the original design. Authored by: Paryanto from STMIK Elrahma Yogyakarta. sir. can you help me?? how to put PIR sensor inside the proteus? in its library the PIR sensor not there.. There're so many software specializations to file here, but if there's a feature of your business that you need explanation on, then there's possible to be a piece of software particularly developed for it.